Last week our senior boys and girls soccer teams travelled to DKIT in Dundalk to take part in the FAI Louth Schools 5-a-side competition. Wednesday was the girls turn, and both of our teams were unlucky not to progress. 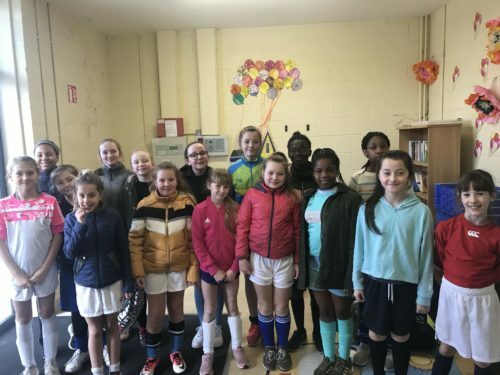 This was particularly the case for our blue team all from 5th class, who earned a draw and a win (including a hatrick from Kayla and some excellent goalkeeping from Odeta) before losing out to an excellent Dunleer side. On Thursday, the claret boys team replicated the girls with a draw and a win – four competition goals from Josh capped off some spirited performances. 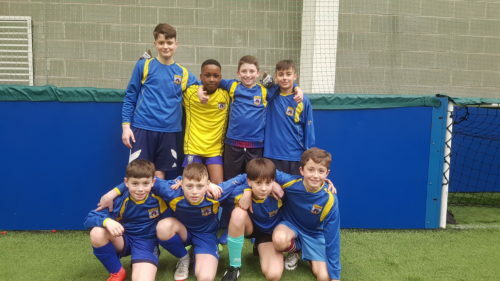 Meanwhile the blue boys team cruised through their group stage, recording 12-0, 6-1 and 7-0 victories over teams from Tullydonnell, Dulargy and Collon. That brought us into a winner-takes-all clash with Termonfeckin to go through to the finals day on April 3rd. After our boys forced in two goals and conceded one and with the game in the melting pot, Justin powered through and smashed the ball right-footed into the top corner that ultimately sealed a 3-2 victory against a gallant Termonfeckin side. 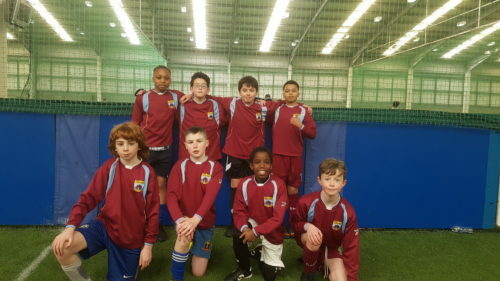 Our boys have now become the first Aston Village team of either gender to progress to the finals day, a feat which is greatly deserved considering the time and effort all have put in to preparing for this competition. Each student acquitted themselves excellently – Jack and Philip darted around and linked the play with purpose, Ryan was a constant source of danger in the opposition half, Yemi turned in some solid goalkeeping displays while also managing to knock in four goals, Kuba was calm, composed and tenacious in the heart of the defence, Conor and Jack who scored five goals a piece showed off their considerable skills alongside some heroic defending, while Justin with his masterful dribbling and fearsome left foot top scored on the day with 8 goals. On 3rd of April, they have a chance to win the Louth competition outright. It is a credit to the boys that on the bus home, they were already plotting how often they would train for the finals. Considerable thanks to teachers James, Des, Orla, Rachel and Padraig for preparing and accompanying our teams on what was two very enjoyable days for our students.